The Pines collection will help you create the perfect entertainment space in your casual contemporary home. These pieces have simple style that will blend easily with any home decor. The counter height table and chairs are available in Black and Walnut finishes to fit your style. Add these pieces to your home, and enjoy gathering around with family and friends. This simple and stylish counter height table and chair set will blend easily with your casual contemporary decor. The smooth rectangular counter height table features a leaf so you can easily extend the length from 36 inches to 54 inches to accommodate guests. Sleek square tapered legs rest below. The matching chairs have vertically slatted backs and square legs, while contoured wooden seats add to the comfort of these chairs. 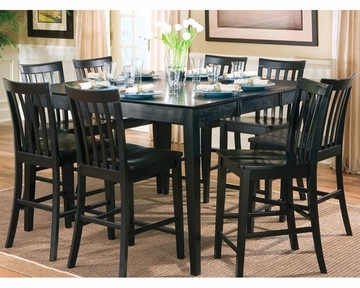 Pair with the matching chairs for a great casual dining and entertaining area that friends and family will enjoy. Counter Height Chair - 18"L x 18"W x 40"H; Seat Height - 24", Seat Depth - 17"